If you've been longing to incorporate patent leather into your handbag collection but hate the "stiff" feel of most options out there, the solution to your dilemma is finally at hand. The chic, relaxed designs from Vanessa Bruno are the perfect bags for women who enjoy indulging in trends, but find it difficult to take the plunge. 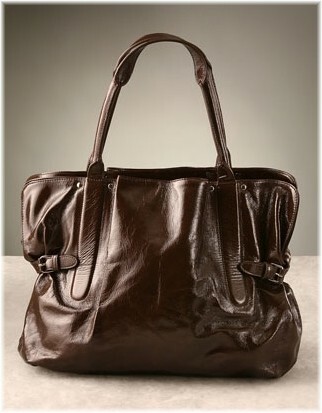 The Patent Tote from Bruno's fall collection is the ideal patent leather bag. Why? The leather is astonishingly soft and flexible, that's why. This large, practical tote which measures an ample 15"x14"x5" features dual leather top handles, gathered sides with adjustable buckled tabs, zip top closure and spacious interior with zip and patch pockets for smaller items. The overall design exudes a casual feel while the patent leather gives it an uptown, polished look. Available in café, kaki and noir, the Vanessa Bruno Patent Tote is a fabulous choice for all the fashionistas who've been waiting patiently for a trendy bag that wasn't obviously trendy. Nab this haute design for $844 via Shopbop.